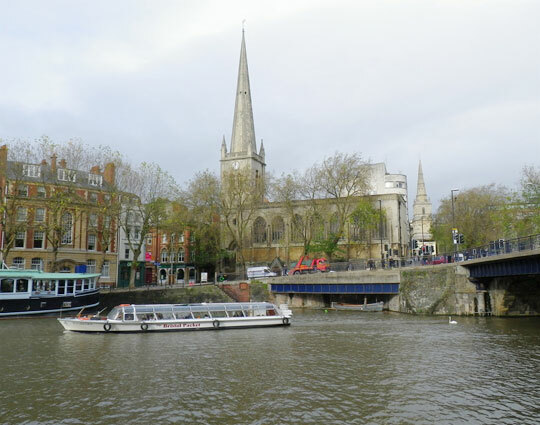 Since the year 2000, BaRAS have been based in St Nicholas Church, situated between St Nicholas Street, Baldwin Street, and High Street in the heart of Bristol’s historic city centre. St Nicholas Church is a Grade II* listed building. St. Nicholas of Myra (c.270–6th December 343) is the patron saint of sailors, merchants, archers, and children. He also had a reputation for gift-giving, and is known popularly as Santa Claus. He was born in Asia Minor during the third century AD in the Greek colony of Patara in Lycia. While he was still a young boy, his wealthy parents both died during an epidemic and he inherited his father’s fortune and the family businesses. He became Bishop of Myra, and is reputed to have argued in favour of the doctrine of the Holy Trinity at the Council of Nicaea (which persists today in the opening lines of the Nicene Creed). He is known for intervening in cases of injustice and for his miraculous intervention in the famine at Myra. St Nicholas died on the 6th December 343. In the late 11th century, the Norman town grew up in the area north of the River Avon between the site of St Nicholas Church, and that of St Peter’s Church in Castle Park. St Nicholas Church was built over the line of the town wall, and included the gate to Bristol Bridge. St Nicholas Church may have begun life as a chapel rather than a full church, and is mentioned in a charter of St Augustine’s Abbey (also in Bristol, on land north of Broad Quay) dated to no later than 1154. The church is built on a hillside, resulting in there being space for both an upper church and a lower church, or crypt. The upper church was the principal worship space, and the lower church may not have been directly accessible from the south until the outer town wall was built in the mid-13th century. Walter Filomena is the earliest vicar whose name we know, holding the post from 1240 until 1246. 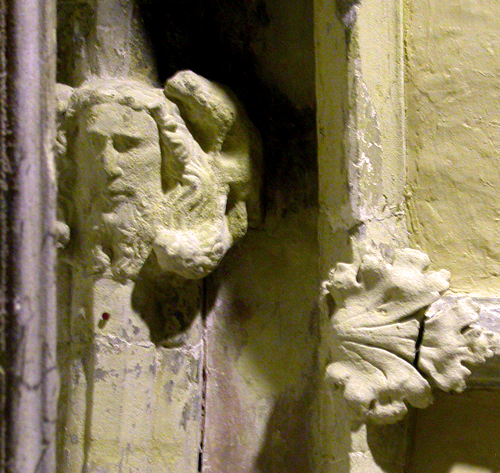 An arch rib bearing a boss decorated with a bearded man, which is clearly not part of the main vaulting, can be seen in the north aisle of the crypt. Beyond that is a room known as the charnel house, which is beneath the pavement on High Street, inside which is the base of a column. These are the earliest surviving fragments of the church visible, and are thought to date from c1250. The arch may represent the full width of the crypt at the time; the town wall ran adjacent to what is now the north aisle. The crypt also retains elements of two further construction phases from the fourteenth century. The church was added to throughout the fifteenth and sixteenth centuries, and was described by Bristol’s first antiquarian, William Worcestre, in c.1480. The church is also featured on a number of maps, such as Smith’s 1558 map, and Millerd’s 1673 map, which both show the church extending over the city gate. When Bristol Bridge was rebuilt in the eighteenth century, it was decided to remove the bottleneck of St Nicholas Gate, which required the demolition of the church above. The new bridge and renewed church were both designed by James Bridges. The church would lose part of its east end due to widening of High Street, so an extension on the west end was planned. Demolition work began in 1762. The lower church was retained, although it was encased in new rubble walls to support the larger floorplan of the upper church. Seven large Gothic windows were installed in each long wall of the upper church, a new tower was built, and three sides of the church were finished in Bath Stone ashlar. The crypt was restored in the early 1820s, and later refurbished in 1893, while the main church was refurbished in 1882–3. St Nicholas Church was among the buildings damaged during the first major Luftwaffe raid on the city on Sunday 24th November 1940. Damage from incendiary bombs completely gutted the upper church, however the lower church, which was in use as an air raid shelter, survived. Services continued in the lower church, now protected by a concrete floor laid inside the burnt-out upper church, until 1959. The parish of St Nicholas and St Leonard was united with that of St Stephen and All Saints, and it was proposed that the church building be demolished. After a subsequent Order in Council, however, the building was re-roofed, and the windows repaired and reglazed, in 1964, and the building leased to the Corporation of Bristol for museum purposes. The upper church today, in use as the offices of BaRAS. The Hogarth triptych still dominates the stage. St Nicholas Church Museum was opened on 22nd October 1973. 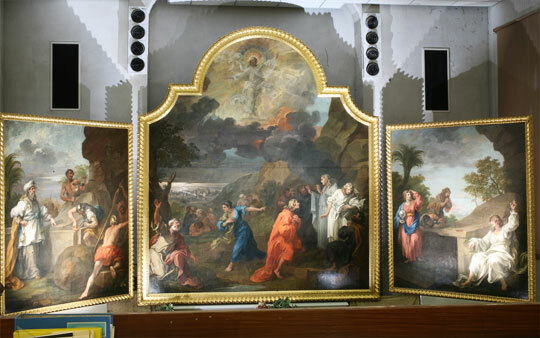 A massive triptych by William Hogarth, originally painted for St Mary Redcliffe, was installed on a stage at the east end. The museum housed ecclesiastical artefacts, and 19th century watercolours, with a display about Bristol’s archaeology and history since the Saxon period upstairs, and a brass-rubbing centre in the crypt. The crypt was renovated in 1980 in an attempt to prevent damage caused by damp, and the sixteenth century monument to Alderman John Whitson was cleaned and reassembled. The museum closed at the end of September 1991, and Bristol’s Tourst Information Centre occupied the building. It is currently jointly home to BaRAS.